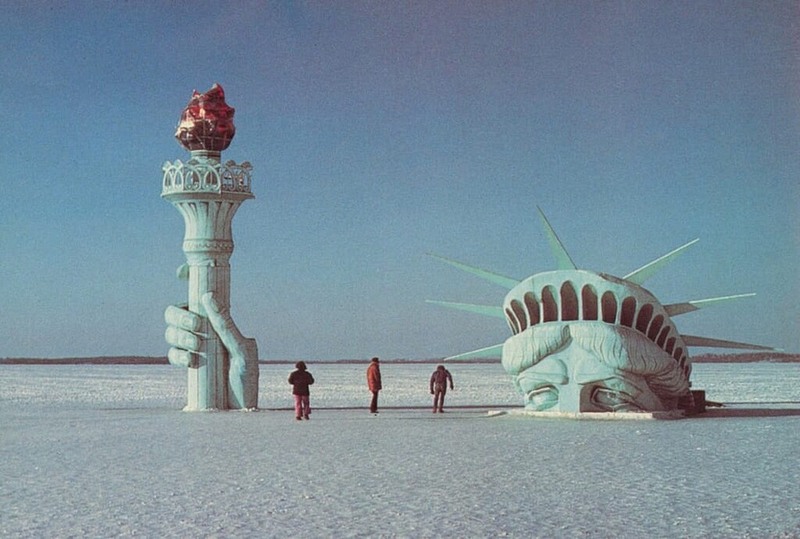 The following winter, in 1979, Pail and Shovel erected a gigantic replica of the Statue of Liberty’s head and torch on the frozen surface of Lake Mendota, in Madison city, creating the illusion that Lady Liberty was emerging from the lake’s bottom. Party leaders Leon Varjian and Jim Mallon spent $4,000 on the Styrofoam structure, a stunt that nearly got them kicked out of office. 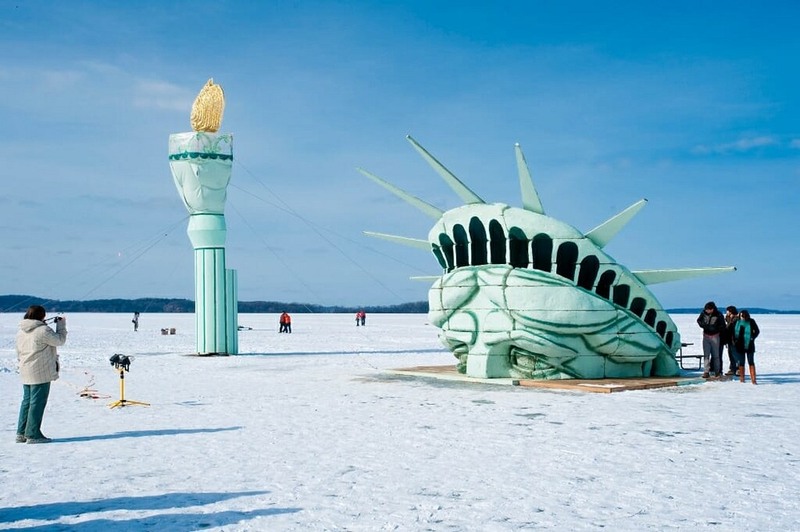 The sculpture became an instant hit, but arsonist burned it down within the first year. The next year, 1980, a fireproof version was installed and the year next as well. But then state regulators demanded the structure be removed from the ice. It continued to appear on the lake occasionally through 2010, after which it stopped. 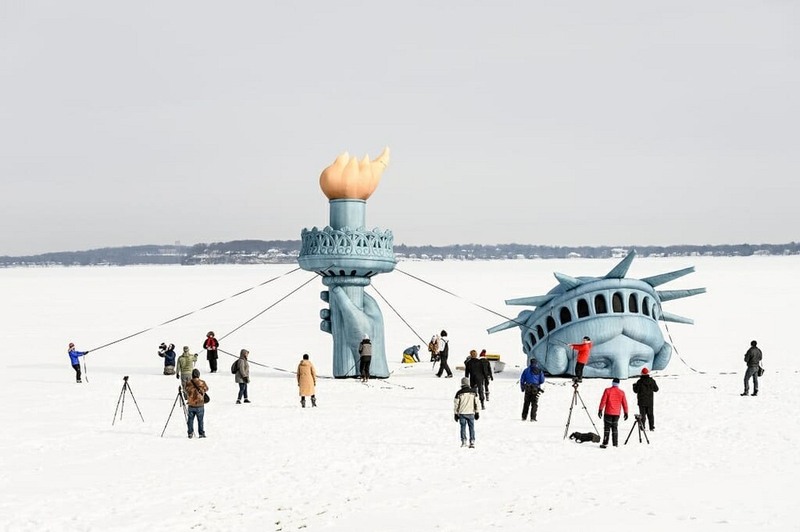 This year, Wisconsin Union brought Lady Liberty back to Lake Mendota to kick off its annual Winter Carnival, after two decades continuing a tradition that started forty years ago. This time, the structure is made of inflatable plastic. Plastic requires less space to store, compared to the Styrofoam version, and could be inflated and installed faster. 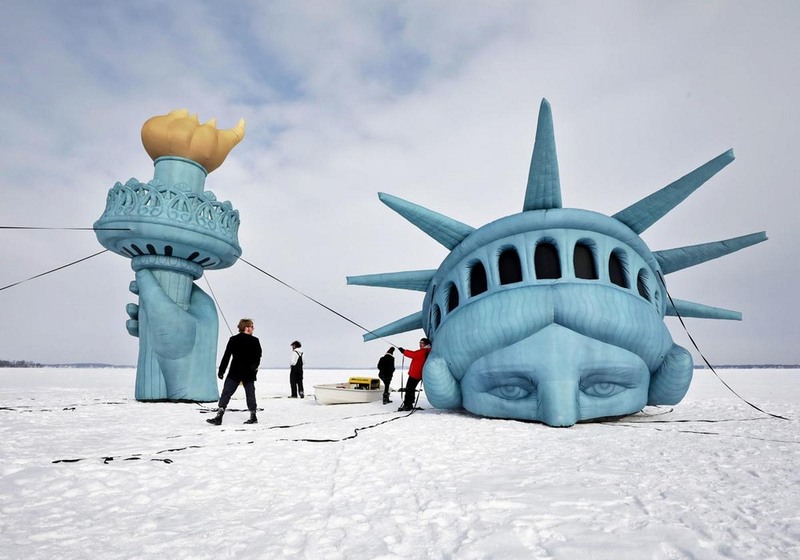 Officials hope to bring her back next year as well as part of the annual Winter Carnival tradition. In another stunt, the Pail and Shovel Party put a flock of one thousand pink plastic flamingos on Bascom Hill in the fall of 1979. Within hours most of the birds were stolen and appeared on lawns throughout the city. Although many students were amused at Pail and Shovel pranks, some were angered at the misuse of student fees. Some sixty students demanded their student fees be returned, and Pail and Shovel responded by issuing sixty checks for ten cents each. Though the Pail and Shovel Party weren’t re-elected for a third term, their pranks live on in stories passed down from students at UW-Madison.